8.00 points at 19 votes (rank 80). 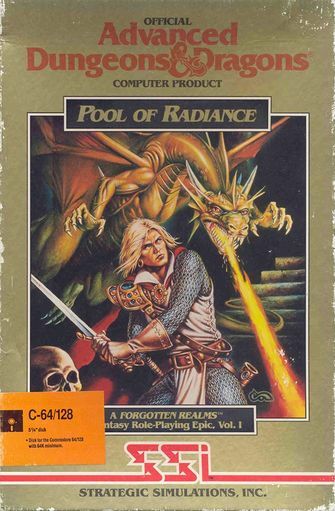 Pool of Radiance is the first role play conversion on the C64 that is based on the official Dungeons & Dragons rules. 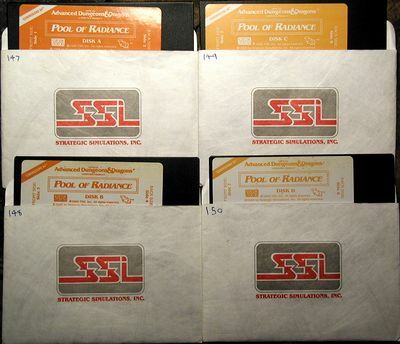 With eight disk sides this was one of the most comprehensive games of its time. 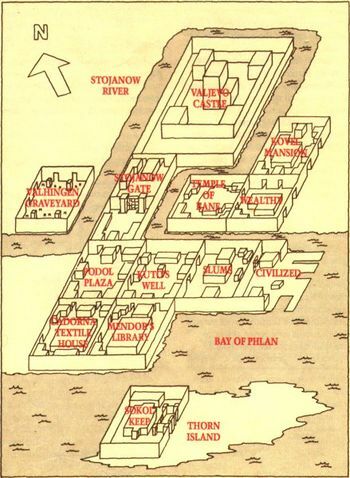 It is situated in the Forgotten Realms world and plays in the town of Phlan. At the beginning of the first game you put together a party. You can choose from six different races (dwarfs, elves, gnomes, halve elf, halflings and humans) and four character classes (fighter, cleric, thief, wizard). Non-human characters can also belong to several classes (e.g. fighter-thief). The character classes decide on which weapons can be used in a fight and which armour can be worn. Clerics e.g. use only blunt weapons, thiefs do not use bows and wear only light leather armour. Magic can only be used by clerics and wizards, but they need to remember their spells by heart before the fights during a rest. 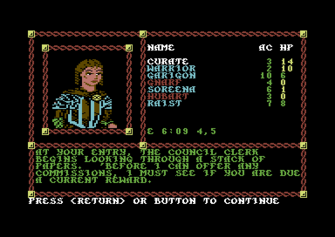 The group can also recruit experienced NPCs for their adventures. During the fights you get experience points, by which the characters' fighting power and life points rise and mighty spells can be used. Additionally, the group can collect the enemies' weapons, armour and treasures after a victorious fight. The old trading town Phlan is in ruins. Only a small part, New Phlan, is inhabited by humans, the biggest part is in the hands of evil creatures. The councillor of New Phlan plans a rebuilding and recruits adventurer to banish the monsters from the adjoining ruins. On the search for treasures and adventures the party sets out for the way to Phlan. All characters start very inexperienced in the first level. For a share of the booty, experienced campaigners can be recruited in the training building, before you set out for the first explorations in the western Slums. Fighters belong to every adventure group and stand at the front line. They can use all armour and weapons, even magical ones. But to do magic themselves is beyond their means. Until the ninth level they gain between 1-10 hits point with the promotion, then 3 HP per level. Wizards grow to be the most terrifying characters, but at the beginning they are utterly weak and work from the background during a fight. They have only few hit points and only know four spells at the start. With each level a wizard gains another spell, but he can also additionally write spells from scrolls into his spell book. Until reaching the 11th level he gains per level 1-4 hit points, after that only one per level. In close combat Wizards use wands or daggers. As long range weapons they have only darts or burning oil flasks available. Clerics fight for everything that is holy to them. Their religion forbids them to carry sharp weapons as well as swords, instead they crack their enemies' heads with maces and hammers. A pure cleric does not use any long range weapons. They are allowed to wear any type of armour and are valuable for the group due to their healing spells. They are also indispensable for fighting against the undead, they have the power to dispel them in droves by speaking out blessings. Until a cleric reaches the tenth level he gains 1-8 hit points per promotion. Thieves seldom choose the direct confrontation but act with cunning and attack from behind. Their trump card is their skillfulness. They can deactivate traps and are excellent climbers. To stay mobile they only wear leather armour and do not use shields. There are only few weapons they can handle, they prefer one-handed swords or daggers. Until the tenth level a thief gains 1-6 hit points per level. A group could do without a thief, but would have also less fun without one. While the party explores the area, you watch the game in the first person perspective in a window to the upper left. There the landscape in front of you is displayed in 3D. Also images of NPCs that you meet are shown here. To the right is the overview of the characters. Here their name, armour class and current life points (hit points) are recorded. While wandering around this window also shows additonally the direction into which the party looks, the time and the position coordinates. The game can be controlled either by keyboard or by joystick. The lower third of the screen is covered by the text field with the descriptions and dialogues. By a text line at the lower part of the screen commandos are chosen or you can navigate through the menus with further options. When battles happen the game switches to an enlarged section of the map, in which the strategic fights are carried out. Each character can make a certain number of movements each round, depending on their skills, and make one action (attack/spell). 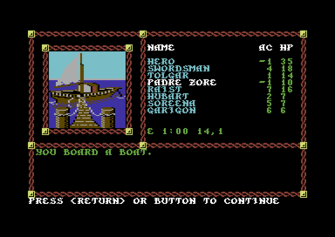 The engine of the game simulates the rules of the 'Dungeons & Dragons' board games, so the events (e.g. caused damage in the fight) are 'tossed with a dice' within certain random parameters. 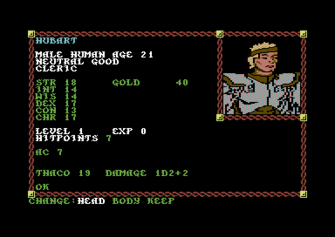 Some of these parameters are also shown in the character overview, e.g. a weapon that can cause 1D6 damage, causes the hit points of damage in the fight that correspond to the numbers on a thrown six-sided dice, so 1-6 points. For each victorious fight the group will get experience. In the training room in New Phlan clerics, wizards and fighters can get tested by the corresponing master to rise one level. However, there are costs of 1.000 Gold Pieces (200 Platin) for the training. Characters that belong to several classes (e.g. fighter-thief) will get very mighty in the later course of the game, but they rise significantly lower in the levels, as the experience points are shared between the classes. While a mere thief gets e.g. 100 experience points after a fight, a fighter-thief will only get 50, members of three different classes correspondingly only get a third of the experience. Also the threshold for entering a new level differs. A fighter-thief can rise to the second thief level with 1800 experience points and will be shown as level 2 character in the view, but he will only be able to practice the skills of a level 2 fighter when he has reached the necessary level there. Clerics can remember additional spells when their skill "Wisdom" has at least 13 points. The maximum level that characters can reach in Pool of Radiance is due to certain restrictions dependent on race and class. Humans are not affected by this and can gain an indefinite number of levels. Furthermore, some races cannot do some professions at all. You should consider these restrictions when creating a character. A human cleric for example will outclass a half-elf cleric in potency and fighting power in the later course of the game. To rise a level the characters need to enter the training room, there the master of the arena decides about the promotion. Clerics and Wizards have a different choice of spells available. Before they can use them in a fight, they have to be learned by heart during a rest. The number of spells that the character can remember is limited, but rises with every level. Wizard do not have all of the spells of their level available, but only those that are written into their spell book. You start with four level 1 spells. However, in the course of the game new spells can be transfered from spell scrolls to the spell book. Clerics do not need a spell book, they know all spells of their level from the start. Some spells are time-consuming and complicated, so they cannot be used during a fight, but in the camp. Even during a fight some moves can pass from the beginning of the conjuration until the spell is finally spoken. If a wizard is disturbed during the phase on conjuration, the spell will expire. Vice versa, also the opponents spells can be disturbed by e.g. hitting them with a dart before the formula was finished. Bless can be spoken in the camp or during a fight. It can be spoken over the characters that are not involved in close combat and it raises the chance to avoid hits (THAC0) for six rounds. NPCs in the party get a bonus of 1 to their moral. In the camp the Bless should only be spoken if you go directly after that into a fight. It is the counterpart to Bless and can be spoken over enemies that are not in close combat. The Curse lowers their probability to successfully strike a blow for the length of six rounds. Curses can only be spoken in a fight. Can be spoken at any time. The character doing magic needs to be in striking distance to the wounded. The spell recreates 1-8 hit points. Can only be used during a fight. The target needs to be in the close combat range. The spell causes 1-8 damage points by touching. Works similar to 'Detect Evil'. The spell shows the presence of magic (e.g. magical items) in a radius of 1x3 fields for the time of one round. But it does not give any information about the type of magic. Can also be used after the fight, when sharing the booty to discover magical items. The spell can be used during a fight or in the camp, if a fight is imminent. The receptor of the spell needs to be within close combat reach, because the spell is applied by a touch with the hand. The character doing magic can also speak the spell onto himself. It raises the armour class of the bewitched character by 2 points against attackers with evil attitude, you get also a bonus of +2 for each saving throw against evil creatures. The spell stays for 3 rounds per level of the magic character. Basically this is the counterpart to 'Protection from Evil' only with the difference that it affects attacks by creatures of good attitude. The spell protects the receiving character from freeze attacks and gives him then a bonus on the saving throw. He is totally immune against freeze attacks until 0° Fahrenheit (about -18° Celsius). The receptor of the spell needs to be in duel range, as the character doing magic must touch him during the spell. Makes all traps visible for three moves that find themselves with the viewing direction of the character doing the magic. Cannot be used during a fight (and would not make much sense there). Works during a fight for humanoid enemies or such resembling humans in size and build. Makes 1-3 (selectively) enemies completely immobile and incapacitates for 4 rounds, plus a further round per level of the character doing magic. Works exactly like the level 1 spell 'Resist Cold', but protects from attacks of heat and fire. This spell is a fighting spell and supresses each noise in a radius of 5 fields, so also casting spells. It is cast on a person, so the character is accompanied by a radius of silence if it moves. If the spell is cast on an empty field, it will hush everyone for the length of 2 rounds per level of the character casting the spell when they move into the affected area. Slows down the effects of a poisoning on the treated character for one hour per level of the character doing the magic. Can be used in the camp as well as during a fight. But to finally heal the poisoning, a higher spell or a healer is necessary. Can only be used during a fight. The cleric can with this conjure a sum of snakes, whose number of hit points correspond to his own. If he is successful, the snakes stop all their activities for 5-8 rounds. Conjures a magical weapon for a short time (1 round per level of a cleric). This can then be used as a long range weapon and causes the damage of a hammer blow. Works also with monsters that can only be harmed by magic weapons. The spell can only be used in a fight. Can be used during a fight or in the camp. It turns a dead humanoid into a zombie, which supports the cleric in the fight (is controlled by the computer). The spell is permanent and works until the zombie is destroyed in the fight. If a space in the group is free, the zombie will travel with the group as an NPC. Cures the blindness that was caused by a 'Cause Blindness' spell. Can only be used in the fight and by touching. The blindness is permanent and can only be removed by a spell as e.g. 'Dispel Magic' or 'Cure Blindness'. The opponent onto which the spell is cast has the chance to protect himself with a saving throw. Can only be used in the camp. Heals diseases that were caused by mummies or by the spell 'Cause Disease'. Can only be used in close combat. The victim has a saving throw. If the enemy is diseased he looses hit points over the duration of the fight until his hit points are reduced to 10% of his full number. Can be used in a fight or camp. In the fight it influences every spell and item in the chosen field, in the camp it influences the person or item that was chosen. The success of the spell depends on the own level, but also the level of the character that has spoken the spell previously. Raises the chances for saving throws and evasive manoeuvers about one for the own people and lowers about the same amount for all enemies. Works in a radius of 60' and stays for each one round per level of the character doing the magic. Removes a curse that is effecting a person by a spell or a cursed item. Can be spoken during a fight and has different effects on the cursed character. The effects are chosen randomly by the computer. This fighting spell is cast by touching. It causes one damage point per level of the wizard. The enemy has no saving throw. Can be used on humanoid enemies. The charmed person will side with the group during the fight, and maybe (when there is a free place) travel with the group as an NPC. The charm is not permanent, depending on the intelligence the charmed person gets another saving throw after some days or weeks and sees the wizard, that he has been following so faithfully, in a different light again. Corresponds to the cleric spell with the same name. The spell shows the presence of magic ( e.g. magical items) in a radius of 1x3 fields. It lasts two rounds per level of the wizard. But it does not give any information about the type of magic that was used. Can also be used after the fight, when sharing the booty, to discover magical items. The spell can be used during a fight or in the camp. The effect stays for one round per level of the wizard casting the spell and raises the body size of the target about 20% per wizard's level. Humanoids can by this get the size of an Oger or a Giant and their strength attributes rise correspondingly. If the person that the spell is cast on, resists the spell, he gets a saving throw. You can only cast one 'Enlarge' spell at a time at a character. Works vice versa as the 'Enlarge' and can also be used as a contrary spell for it. The spell reduces size, strength and movement radius. It is a fighting spell. All characters that are in the radius of the spell (enlarges with rising level) think the wizard has a higher charisma (2-8 points). Towards enemies with a successful saving throw, however, the charisma sinks by 1-4 points. The spell lasts for one round per level of the conjuring person. This fighting spell causes 2-5 damage points and always hits (no saving throw). Every two levels a magic user gets another arrow. So a level 3 wizard can shoot 2 arrows, optionally on different targets, a level 5 wizard even 3 arrows at once. Corresponds to the cleric spell with the same name, but lasts for two rounds per level. The spell can be cast during the fight or in the camp, if a fight is imminent. The receiver of the spell must be in close combat range, as the spell is cast by touching. The person doing the magic can also cast it on himself. It raises the armour class about 2 points against attackers of bad attitude and also on every saving throw against evil creatures you get a bonus of +2. Basically this is the counterpart to 'Protection from Evil' with the difference that it effects only attacks from creatures with good attidute. Also this spell lasts for two rounds per level for wizards, in contrast to the spell for clerics. Can only be used in the camp. As soon as the spell is cast, the wizard can read the spells on a spell scroll (does not work for cleric scrolls). Finally he can use the spells in the fight and if he does not know them yet, he can also enter them into his spell book. This spell raises the armour class and the chance for saving throws for the bewitched. It also eliminates the effects of a Magic Missile attack. Causes 1-8 damage points in the fight by electricity when touching in close combat. Sets up to 16 enemies (at the beginning up to 9) in the surrounding of the wizard into a deep sleep which lasts 5 rounds per wizard level. Weaker enemies are affected first, the bigger the monsters the less are set to sleep. In deep sleep the enemies are completely helpless against attacks and are hit deadly by each attack. There is no saving throw, but mighty enemies are immune against the spell. The spell can be used in the camp or during a fight and detects invisibility for five rounds per wizard level within a radius of 20 feet. Makes a target within touching reach invisible for all gazes. He will not get attacked as long as the effect of the spell lasts or he himself attacks someone. The spell can be used in the camp or when wandering around. It opens locked doors or chests. The spell creates 1-4 mirror images of the wizard for 2 rounds per level. If a mirror image is attacked it vanishs into thin air. Weakens the enemy for the length of one round per wizard's level. During this time the target causes less damage at attacks. However, the victim gets a saving throw. Works within an area of 2x2 fields in a fight. Each person under influence of the cloud has a saving throw, but if it fails, the person will be totally helpless (similar to 'Sleep') for 2-5 rounds. The victim can move out from the cloud but will be helpless for another round and hit deadly by every attack. The cloud stays for 1 round per wizard level. Can only be used in the camp. Raises the strength value of the bewitched for 6 rounds per wizard level. How much stronger the bewitched character will be varies and depends also on his class. After the wizard has spoken this spell, he can mostly not be attacked because he 'blinks'. He appears and disappears again and again. The spell stays for one round per level of the wizard. Corresponds to the spell for clerics. Can be used during the fight or in the camp. During the fight it influences every spell and item in the chosen field, in the camp the person or item that is chosen. The success of the spell depends on the own level but also on the level of the character who has cast a spell before. A mighty fighting spell. It causes 1-6 damage points per level of the wizard. Outdoors the fireball expands to a radius of 2 fields, inside a closed area surrounded by walls it expands to a radius of 3 fields. If a victim succeeds in a saving throw, the will only suffer half of the damage. This fighting spell can be used on each one person per level of the wizard. Everyone who the spell is cast on moves twice as far and attacks twice in close combat or with long range weapons (a cleric or wizard however cannot cast two spells per round). The spell lasts for 3 rounds plus another round per wizard's level (so for a level 2 wizard it is 5 rounds). Works exactly as the level 2 cleric spell with the same name for humaniod enemies. However, it can be used for 1-4 enemies and last for 2 rounds per wizard's level. Corresponds to the spell 'Invisibility' but affects also other characters in a radius of 10 feet around the wizard. When the wizard's invisibility ends, it will also end for the others. The bolt hurts everyone that is in its way and causes 1-6 damage points per wizard level. The bolt is at least four and maximum eight fields long. If it hits a wall, it is reflected until it has reached its maximum extent. When a victim succeeds in a saving throw, the damaged is reduced by half. Corresponds to 'Protection From Evil', but unfolds its effect in a radius of one field around the target. Corresponds to 'Protection From Good', but unfolds its effect in a radius of one field around the target. Protects a character within touching reach from normal long range weapons (arrows, bolts, darts) for one round per wizard's level. But does not protect from magical missiles. Slows an enemy down for 3 rounds plus one more round per wizard's level. The victim only moves half as far and attackes half as often as before. If the victim has only one attack per round, he can only attack every second round. The spell can also be used to neutralise the effect of 'Haste'. 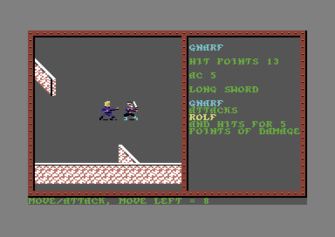 The damage that weapons will cause in the fight, is 'decided with a die' by the engine according to the rules of the 'Advanced Dungeons & Dragons' board game. Certain weapons additionally have bonuses or deductions when used against monsters that are bigger than humans. E.g. a dagger causes 1D4 damage when the attack is successful (against an enemy of human size). 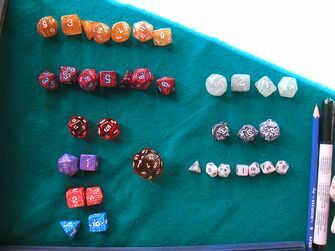 The 'D' is for 'dice', so the caused damage corresponds to the number on a thrown four-sided die, so at least one and a maximum of four hit points. A broad sword causes a damage of 2D4, so the sum of the numbers of two throws with such a four-sided die. The caused damage is in any case at least two and a maximum of eight hit points. In close combat further points can be added if there is a corresponding strength value. In the following tables the damage points of some selected weapons are shown in the effective sum. One-handed weapons allow carrying a shield at the same time (not for wizards) and lower by this the damage cause by attackers. Fighters can use all weapons, clerics are only allowed blunt weapons. Thieves on the other hand use only one-handed swords and daggers anyway, wizards are only allowed the dagger as a one-handed weapon. It makes sense to equip a (pure) cleric with a one-handed weapon and a shield, as the few blunt stick weapons are only barely efficient. Two-handed weapons can cause fatal damage. The user of the weapons also accepts the greater hazard to get hurt more at a counter attack, as he cannot protect himself additionally with a shield. Stick weapons are most of the time also two-handed (exception: pike, awl (thorny pike), it can be used in combination with a shield) and often cause additional damage against superhuman-sized enemies. Wizards should always be equipped with a fighting staff (Quaterstaff), as it causes more damage than the dagger and the wizard is not allowed to carry a shield anyway. Thieves do not use two-handed weapons, and stick and two-handed weapons also do not make much sense with clerics, who only use blunt weapons. Long range weapons are an important tactical instrument in the fights in Pool of Radiance. However, they require ammunition (stones, arrows, bolts) that need to be refreshed. (Exception: stones for the sling can be simply picked up on the spot). With them, weaker characters can act from the safe background. At the same time they are used against enemies that themselves are out of the close combat reach or are on the run. They also have a great significance in the fight against the hostile wizards that act mostly in the background, to keep them from casting spells. (A hit wizard cannot concentrate enough in the round after being hit. Even though he will be interrupted only during the conjurement, the spell will expire.) Fighters should always carry the best bow that is available with them. Bows have the advantage over the crossbow that you find more often arrows than bolts after fights, so its easier to refill your ammunition. Each thief should have a sling with him, a wizard enough darts. Though the sling and the darts only cause little damage, they are enough to hunt down stricken or helpless enemies or to prevent a wizard from casting a spell. Heavier armour protects characters from the enemies' hits, but they also restrict his mobility. For this reason thieves only wear leather armour, wizards wear none. A shield lowers the armour class by one point. The lower the armour class, the less the damage of the enemy when you get hit. In the course of the game you will find enchanted armour that offers even better protection. The maximum amount of coins that a character can carry is limited in Pool of Radiance by the weight and this also strains the mobility. 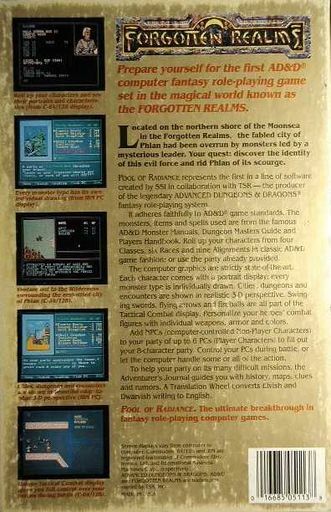 Additionally, in Pool of Radiance circle different types of coins. The relation of weight and value is best with gems, however, they can reach different prices when exchanged in shops. In the later course of the game it is not worth any more to pick up the copper coins in the booty. Gold is the unit in which is measured how much an item weighs and a character can carry. These small humanoids are very common in the Forgotten Realms ... at least they were until our group of adventures moored at the coast of New Phlan. Gremlins are small, gutless humanoids. They spend their day with murdering and torturing, but most of the time it is nice to meet them, because they are one of the weakest creatures in the Slums. Experienced fighters can hit several Gremlins with one sweep due to their small size. Orcs are evil, pig-faced humanoids. You will meet them often in the Slums. 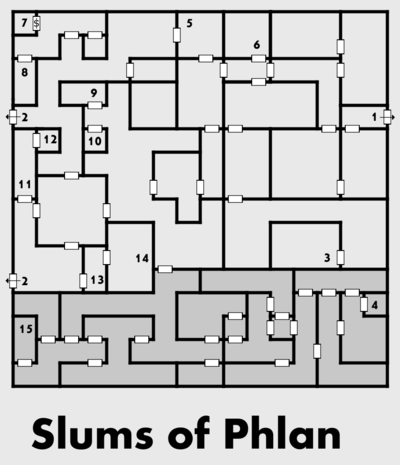 The City Watch of Phlan is positioned in front of the doors of important facilities, intervenes in rows or partially warns adventurers who try to camp wildly in the neighbourhoods of New Phlan. If you follow their instructions, there will be nor trouble. It is not advisable to take them on, they are experienced fighters. Hobgoblins are related to Goblins. But they are approx. as tall as humans and more intelligent than Goblins... a bit at least. Trolls are huge, disgusting humanoids. What they lack in intelligence they compensate with strength and courage. They do not know fear and partially regenerate their wounds. Skeletons are the lowest of the undead creatures. A heap of bones they was revived and is controlled by a dark power. The Civilized Area of New Phlan is the base camp for the group. From here the adventure starts and the party always retreats here to stock up supply, train and pocket the pay for the gained maps at the City Council (10). The first experiences are made by the party by cleaning the Slums adjoining to the west from monsters. Captured bows and armour bring good money in the Weapon Shop (5), you should not burden yourself with items of low value as shields or swords. The clocks are working differently in the Forgotten Realms. The day is from 0:00 to 11:59. During this time, the shops are open, from 12:00 they are closed. 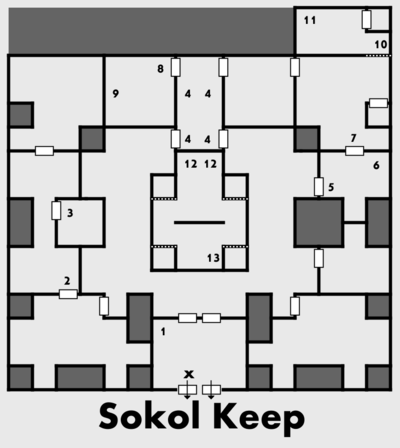 The Slums count as cleaned as soon as you have freed all rooms from monsters and absolved 15 random encounters. Ohlo (3) offers an additional quest, he wants us to get him his potion. At the beginning you should go for the Orcs in the northern area (16). As these are only a group of four, they are easy prey. Following you can take a rest in that room. At Ohlo's (3) You should speak with him to finally get the quest to fetch his potion for him (4) (speak, OHLO). The trolls (15) in the south-western corner of the Slums are a hard nut to crack. You should only face them towards the end after you have gained a bit of experience (save beforehand). You should only save in the Slums onto an extra save disk, as there are very many random encounters with wandering monsters and the own party is very weak at the beginning. In the later course you can rest in the rooms now clean of monsters. Wizards should learn the spell 'Sleep' by heart. Almost all monsters in the Slums are humanoids and you can temporarily knock out up to nine enemies. 8. Encounter with the ghosts of the old guard. LUX pacified. Journal Entry. Zore: "The opener to a successfull series of RPGs as Curse of the Azure Bonds or Secret of the Silver Blades that are based on the same engine. The introduced strategic fighting system was at that time surely one of the highlights. 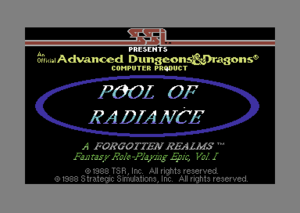 A small drop of bitterness in Pool of Radiance is the numerous loading and the long loading times. The German version of this article on www.C64-Wiki.de was "article of the month" in April 2014 and "article of the year" 2014. This page was last modified on 22 October 2016, at 16:46. This page has been accessed 13,663 times.